The Nathaniel Hawkins Cemetery is near the western edge of South Haven Hamlet on the Wertheim National Wildlife Refuge just to the east of Little Neck Run, about 500 feet east of Old Stump Road, south of Montauk Highway. To visit, a permit is required from the National Fish and Wildlife Service, and the area is normally excluded from visitation between the end of March and October. It is said that there were at least 11 interments here, including one said to be a Revolutionary War veteran -- Nathaniel Hawkins. One source records that Nathaniel Hawkins' father Zachariah Hawkins, was also interred in this cemetery; Zachariah was also a prominent Revolutionary War patriot. I visited the cemetery in March, 2003, with Marty Van Lith, but I have not visited it since. It had been very badly vandalized in the 1980's. There are no stones which remain standing, and there were only five stones and stone fragments that were still readable. One stone, said to be still readable, was face down and still frozen in. It will have to be photographed in warmer weather. Unless substantial conservation efforts are undertaken, this historic cemetery will likely be lost. Most of the information on the burials in this cemetery are as recorded in the Town of Brookhaven Historian's c. 1939 cemetery inventory, and a transcription of the gravestones recorded about 1975 (see B Kress cemetery notes). Additional information was obtained from http://longislandgenealogy.com/NatHawkins.html. While not indicated in this source, I suspect that the referenced survey was by Elbert (Nate) Carter. It is undated. David Carter's stone was moved to the old Brookfield Cemetery (#9A) in Manorville, by his family about 1997 and placed near his parents' monuments. Samuel Hawkins, his wife Mehitable Tuthill Hawkins, and son David Tuthill Hawkins gravestones were moved to Baiting Hollow, Town of Riverhead, Suffolk Co. NY cemetery by family members. This cemetery is #39 on the c. 1939 Town of Brookhaven Historian's Cemetery inventory, has Suffolk County Tax Map reference 200-933-03-1, and has Historic Site ID Br02. 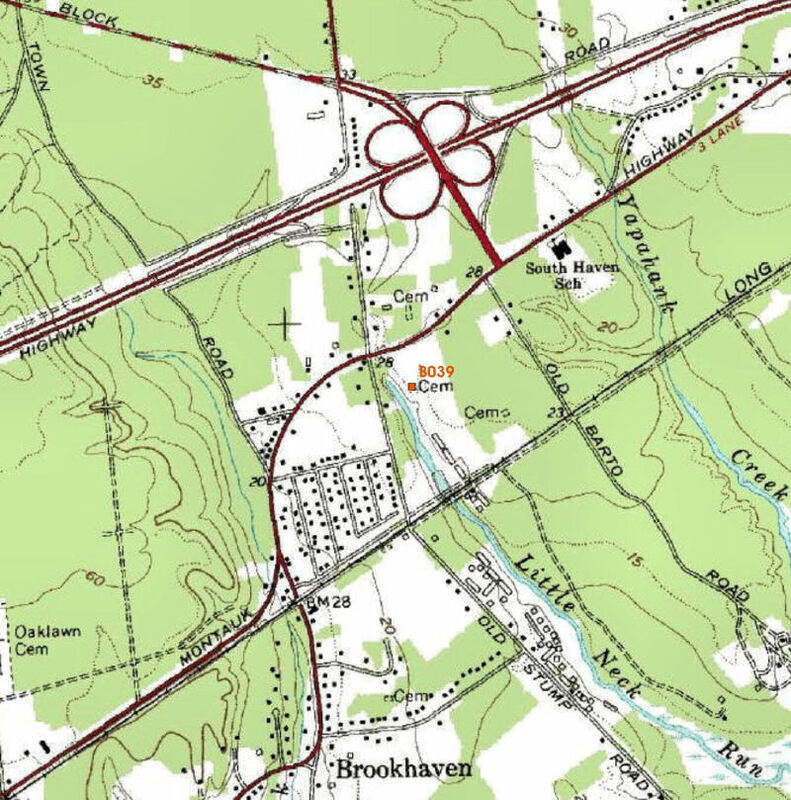 It has been assigned Brookhaven Town Department of Parks and Recreation ID 5195C39. Its global positioning coordinates are Latitude N40° 47.367' Longitude W72 54.683' as determined from USGS maps. A local resident's notes on the gravestones in the Nathaniel Hawkins Cemetery, written about 1975.